Readers Digest Christmas Album "Back Home for Christmas"
Produced by RCA custom products, catalog #RDA 110-A released 1973. This 5 L.P. set was produced by RCA custom "Recorded in magnificent Dynagroove sound"
The set included Julie Andrews, Perry Como, Chet Atkins, Jack Jones, Ed Ames, & The Robert Shaw Chorale. 1- The first noel - Ed Ames, Orchestra conducted by Fred Hunter. 2- O Little town of Bethlehem - Anita Kerr singers. 3- Adeste Fideles (O Come, all ye faithful)- New Philharmonia Orchestra, Morton Gould, cond. 4- We three Kings of Orient are - The Robert Shaw Chorale. Robert Shaw, Conductor. 5- It came upon the midnight clear - Julie Andrews, Orchestra conducted by Andre Previn. 6 - Joy to the world - The Robert Shaw Chorale and RCA Orchestra, Robert Shaw, Conductor. 1- Have yourself a merry little Christmas - Jack Jones, Orchestra conducted by Pete King. 2- Silver Bells - Al Hirt trumpet, Orchestra conducted by Jack Pless. 3- I Heard the Bells on Christmas day- Harry Belafonte, Orchestra cond. by Robert DeCormier. 4-I'll be home for Christmas - Floyd Kramer, Piano. 5-It's beginning to look a lot like Christmas - Kate Smith, Orchestra conducted by Peter Matz. 6-The Christmas song - Danny Davis and the Nashville Brass. 1- O Holy Night - Perry Como with Ray Charles singers, Orchestra conducted by Nick Perito. 2-Angels we have heard on High-The Robert Shaw Chorale and RCA orch Robert Shaw, Cond. 3-Good King Wenceslas - RCA symphony orchestra, Morton Gould, conductor. 4-Away in a manger - Sergio Franchi, vocal. Orchestra conducted by Marty Gold. 5-The Coventry Carol/God rest ye merry, Gentlemen - Chet Atkins, Guitar. 6-Silent Night - The Norman Luboff Choir. 1-Winter Wonderland - Eddy Arnold, vocal. 2-Home for Christmas - New Philharmonia Orchestra Morton Gould, conductor. 3-Let it Snow! Let it Snow! Let it Snow! Ed Ames, vocal. Orchestra conducted by Marty Gold. 4-O Tannenbaum - The Three Suns. 5-Wintertime and Christmastime - John Gary, vocal. Orchestra conducted by Peter Matz. 6-Toyland - Perry Como with the Ray Charles singers, Orchestra conducted by Nick Perito. 1- White Christmas - Jim Reeves, vocal. 2- Deck the Halls - Chet Atkins, Guitar. 3- The Heart of Christmas - Sergio Franchi, vocal. 4- Sleigh Ride - Al Hirt, Trumpet. Orchestra conducted by Marty Manning. 5- The Little Drummer Boy - The Norman Luboff Choir. 6- Do You hear what I Hear? - Kate Smith, vocal, Orchestra conducted by Peter Matz. 1- Santa Claus is coming to town -Skeeter Davis, vocal. 2- Up on the Housetop - Eddie Arnold, vocal. 3 - Jolly old St. Nicholas - Chet Atkins, Guitar. 4-Frosty the Snowman - Porter Wagoner, vocal. 5-Rudolph the Red nosed Reindeer. Hank Snow, vocal. 6-Jingle Bells - Jim Reeves, vocal. 1-I wonder as I wander - Ed Ames, vocal. Orchestra conducted by Frank Hunter. 2-Lamb of God - Julie Andrews, vocal. Orchestra conducted by Andre Previn. 3-O Sanctissima - The Robert Shaw Chorale and RCA victor symphony orch. Robert Shaw, cond. 4-Ave Maria - Perry Como, vocal with Ray Charles Singers Orchestra conducted by Marty Gold. 5-O come O come Emanuel - The Robert Shaw Chorale. 6-Panis Angelicus - Sergio Franchi, vocal. Orchestra conducted by Marty Gold. 1-Christmas is - Jack Jones, vocal. Orchestra conducted by Pete King. 2-The Gifts they gave - Harry Belafonte, vocal. Orchestra conducted by Robert DeCormier. 3-Christmas is the warmest time of the year - Ed Ames, vocal. Orchestra cond by Jimmie Haskell. 4-Go, tell it on the Mountain - The Robert Shaw Chorale, Robert Shaw, Conductor. 5-Sweet little Jesus boy - John Gary, vocal. Orchestra conducted by Peter Matz. 6-Sleep Precious Babe - George Beverly Shea, vocal. Orchestra cond by Norman Leyden. 1 -I saw Three Ships - The Robert Shaw Chorale. 2 -What Child is This - Ed Ames, vocal. Orchestra conducted by Frank Hunter. 3 -Hark! the Herald Angels Sing” - Chet Atkins, Guitar. 4- Irish Carol - Julie Andrews, vocal. Orchestra conducted by Andre Previn. 5 -Indian Christmas Carol - The Living voices. 6 -Ave Maria - Sergio Franchi, vocal. Orchestra conducted by Marty Gold. 1 -Happy Holiday - The Living Strings and The Living Voices. Conducted by Johnny Douglas. 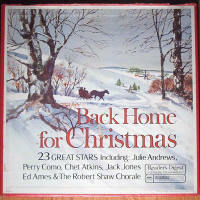 2 -Home for the Holidays - Perry Como, The Ray Charles singers, Mitchell Ayers and Orchestra. 3 -Wassail Song - The Robert Shaw Chorale. 4-C-H-R-I-S-T-M-A-S. - Jim Reeves, vocal. 5-Jingle Bell Rock - Danny Davis and the Nashville Brass. 6-What are you doing Christmas eve? - The Living Voices.